A while back I mentioned that I really love Denyse Schmidt, her design, and fabric, but my top favorite fabric designer is Heather Ross. 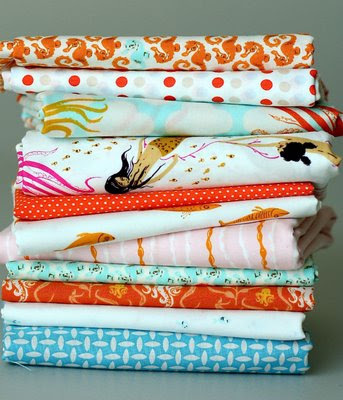 I suppose I love her so much because I make mostly baby quilts, and her cute (not cutesy) lines of fabric are perfect. I also LOVE her color combinations--lots of oranges, blues, pinks, golden yellow...all favorites. I finally got my hands on her latest line, Mendocino, and it's as lovely as can be--fishies, octopi, seahorses, and don't forget the mermaids! My daughter wants a quilt with mermaids! This: will soon be this: I don't often sketch out a quilt, but every once in a while I can't see the whole picture in my head and a sketch works nicely. Oh, I can't wait to see it all finished! It is going to look wonderrul. That fabric is so cute! I've always wanted to make a quilt like this. I love the flow of color and the motion of the design. pretty! 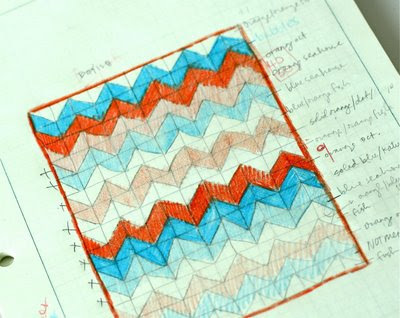 i could do zig zags over and over in bunches of different ways..so great!!! Oh gosh it's gonna be great! I need to get some of that fabric too... it's so pretty! i love my heather ross quilt from you- (i mean avery loves it). your sketch is wonderful, the quilt will be so much better! can't wait to see it complete. yeah, mendocino is such a great line! I need to get some. At quilt Market she wore the cutest dress made out of one of the prints!